Build a Unicorn army and betray your friends. That is the mantra for Unstable Unicorns. This brightly colored card game will spark a competitive spirit in anyone and leave you wanting to play over and over again. Players start with little baby unicorns and attempt to build up the unicorns in their stable to defeated your friends. Unstable Unicorns comes with 132 cards and the game rules - nothing complicated. Learning how to play only takes a few minutes with the simply designed rule book below. Can you use your unicorn's magic to tip the odds in your favor? Can you successfully upgrade your stable while downgrading your opponents? Learn more about Unstable Unicorns and give it a try today! If you can be the first person with the needed number of Unicorns in your stable then you'll become the winner. 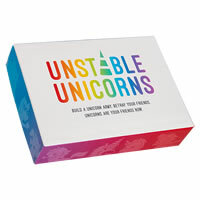 You'll get 132 cards and the official Unstable Unicorns game rules and instructions. Please keep in mind that the official Unstable Unicorns dice-card rules and instructions could be different depending on the game version you have. The rules below are some of the exact directions on how to play Unstable Unicorns. Share with us your comments, funny stories, tips, advice, strategies, creative ways to play, questions about how to play, problems with the rules or anything you want about Unstable Unicorns. All submissions will be reviewed within 24 hours. Click here to add your Unstable Unicorns comments. Looks like there are a couple different versions of this game. Do the game rules vary or is it just artwork and packaging updates?